Today I have a new free pattern for you that is made with Red Heart’s Super Saver Ombre yarn – Have you seen this yarn? The gradual monochromatic color changes are so pretty that it makes your project come out great! This pattern uses a variation of the half double crochet stitch that is easy to do (see instructions below or check out this video to master this stitch). So, all you have to do is sit back and let the yarn do the work! I named this scarf “Ombre Log Cabin Infinity Scarf” because I created it and crocheted about half of it while my family and I were staying in this cabin in the mountains. We tried something new this year by going away for a few days before Christmas – it was fun to relax in the woods and enjoy the winter wonderland of snow. Of course, part of my relaxation included crocheting. I love this stitch and how it has a knit-like texture. The key to making it look this way is to complete it in the round and always have the Right Side facing you. I made mine very long (66″) but if you would like yours a little shorter, then ch 150 instead of 200 (see below). The yarn is very soft and has a lot of drape so it hangs nicely around your neck and over a coat. First a long row of sc is created and then joined together to make a large ring. After this first row, project is worked in the round with the Right Side facing. Row 1 (Right Side): Working in the back bar of the chain, sc in 2nd ch from hook and in each ch across. Do not turn. Join with a sl st in 1st sc of row making sure not to twist the row. Round 21: Ch 1, sc in same st and in each st around; join with sl st to first sc. Fasten off. Weave in ends. Use yarn tail at beginning to sew up edge of Row 1 below 1st sl st.
Hope you enjoy making this scarf as much as I did – Please send along a photo of your project or post on Ravelry – I would love to see what you make! I don’t understand your Hhdc stitch —– I’m left with one loop on the hook. What am I missing? Hi Julie – You should always have one loop left on the hook at the end of each stitch. I will be posting a video of this stitch soon on my Youtube channel – here – Let me know if you have any other questions. Jennifer, Just happened on your blog, thru Red Heart, and your work is so beautiful…I am blessed to live up in the beautiful Blue Ridge Mountains of Va…not a darlin cabin, mind you, but a ranch house. I’m not too gut at doin crochet, but this ombre herringbone cold looks like a gut place to start. Your Celtic designs are amazing…having come from Irish heritage…Hulsey..County Cork…it has a special place in my heart!! Thank you for your lovely pattern and may every day of your life be as enjoyable as that lil cabin in the woods. God bless you!! Hi Katie – Thank you for visiting and your kind words! 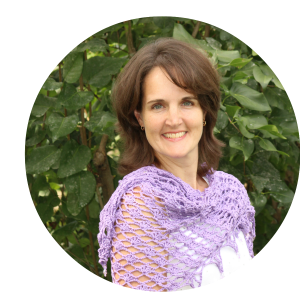 I hope you enjoy crocheting the Ombre Log Cabin Scarf – there will be a video posted soon to help you along with that. You’ll find it on my Youtube Channel – here God Bless you, too! This is a clever stitch, thank you! You are welcome! Hope you have fun making this scarf – Happy crocheting! I did make this scarf, and it turned out beautifully! I should have snapped a photo to share with you, but I participated in a local boutique and thus scarf sold quickly! I’m beginning another scarf in a deep pink ombré and will share a photo this time when complete. Thanks for sharing this pattern. So glad to hear you made this scarf and it turned out well. Congrats on completing a project and selling it quickly. 🙂 Yes, please send a photo of your next one – would love to see it. Happy crocheting!